Brewed 06/12/16. Finally, I get to brew a summer beer while its warm enough to feel like summer outside!!! My Munich Helles required jeans and long sleeves and I brewed that in May. Oh well. Anyway, this is my third time brewing my main summer beer, Serrated Summer Ale. The first time I brewed this ale, it was basically a different beer. It was essentially a knockoff of Two Brothers Sidekick extra pale ale. Its a very light pale ale with a big tropical and citrus kick, but its definitely West Coast. The beer is crisp, dry, and clear. If that appeals to you more, check it out here. The second version of this beer, as well as this version, are more modeled after a beer called Eureka by TreeHouse. Eureka is a blonde ale, but not in the traditional sense. When most people think of a blonde ale, they think of an entry level craft ale that isn’t a drastic departure from the macro lagers that many enjoy. The beer is typically crystal clear, subtle, and crisp. There usually isn’t much going on in the way of hops or any sort of yeast profile. I dare say that blonde ales are a bit boring. I enjoy them from time to time, and have even brewed several, one I really liked, but if I want crisp, refreshing with not a lot going on, I’ll usually take a lager like a Helles. Eureka, and my Serrated Summer Ale, are not blonde ales of this traditional variety. The beer is cloudy in the New England/Northeast IPA style of beers. The soft mouthfeel is there. And so are those beautiful citrus and tropical hop flavors. The beer is still super light and easy drinking, and I’ve only tried Eureka once, but I imagine I could guzzle those by the dozen during the summer. That brings my to this summer ale. I wanted something similar to Eureka, but I’m not really into doing clones. Given what I know about brewing New England style beers, I figured I could brew something close to Eureka without knowing really anything specific about it, and I succeeded last year in that effort. This year’s Serrated Summer Ale really isn’t much of a departure from last years batch. I kept the OG down a little bit just to make this one even lighter and more sessionable. I’m shooting for an ABV between 4% and 4.5%, last year was about 5%. I simplified the hop bill a bit, cutting out Zythos hops and strictly focusing on equal parts Citra and Galaxy. This beer should be packed with citrus and tropical fruit flavors that should be perfect in the summer months coming up. I subbed flaked wheat in place of oats from last years, I just prefer the body they provide over the oats. As usual, my yeast of choice is Wyeast 1318 London Ale III. Last years version of this ale was the first time I used London Ale III and I haven’t looked back. I love this yeast and have written about it in great detail in a number of other articles here, but its just so damn good. Cheers! I finally got to wear some short sleeves on brew day this time! This was a fairly quiet brew day. I play in an ice hockey league and I had a 8:00 pm game on the night of brew day, so I wasn’t able to partake in my usual shenanigans. Don’t get me wrong, beers were had, but I kept things pretty low key. Steve came ove rto help me out which was very much appreciated. I brew a modified version of BIAB, where I still do typical mash volumes, and I fill another pot with the full sparge volume and basically soak the grains in that for another 15 minutes. This method usually gets me between 70 to 78% efficiency. The downside is it can be a pain to brew alone. I like to squeeze the grain bag to get all the sugars I can out, and that’s hard to do alone. Long story short, thanks Steve! I was having some thermometer difficulties on this one, the digital reading seemed to jump around a lot even after I changed the battery, but I think I got my mash temp around 154, a bit shy of the 156 I was aiming for. I really don’t want this one drying out too much. Around the half hour mark I went to stir and found that I had lost four degrees which is not typical. I’m guessing it was from their being less volume in the mash, so there was more headroom in the kettle for heat to escape, even when covered by my usual pile of blankets. I heated it back up to 156, stirred and covered again. The rest of the brew day was fine. I boiled for 60, hit all my hop additions, and chilled to 180 for a 30 minute hopstand. I did run out of propane once with about 15 minutes in the boil, but I always have an extra on hand to that was a quick fix. After the hopstand, I chilled the rest of the way down. My hydrometer sample was right on the money at 1.045. I pitched my yeast and into the ferm chamber it went. As always, I’ll post a kegging update and tasting notes as I go. Here’s the recipe and water profile. Keg Update: The FG of this beer came in at 1.015, giving me an abv of 4% which is perfect for summer drinking sessions! The aroma and hop flavor were great going into the keg for more dry hops, so I can’t wait to see how this turns out! 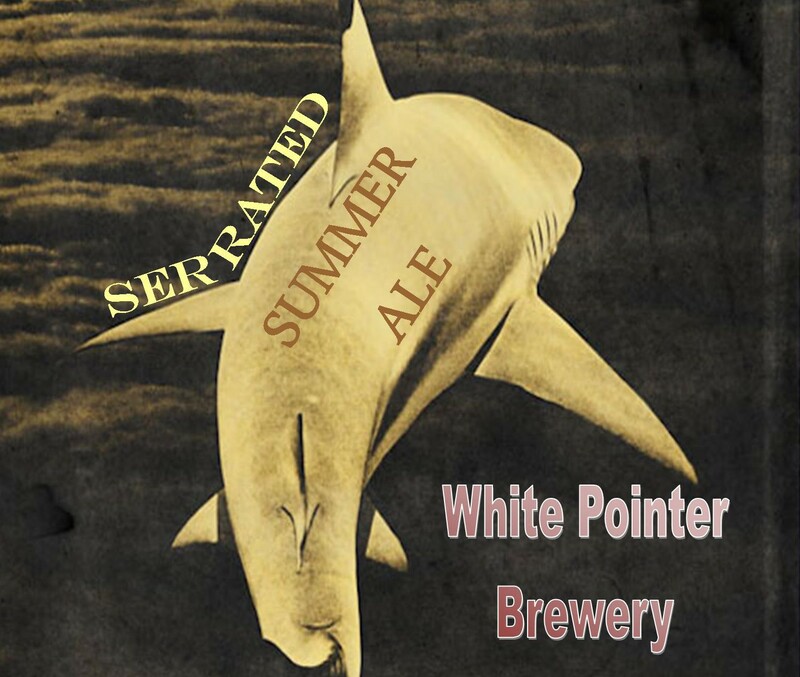 Appearance: Serrated Summer Ale pours a hazy gold with hints of orange and a fluffy white head. If you’re a fan of New England style pales, this should appeal to you. As stated above, this doesn’t look like your typical blonde ale. Smell: This beer has a very fruit forward aroma. There’s a ton of passion fruit, citrus, pineapple, mango, and some lemon zest. The aroma is really pleasing on this one. Blending with the hop aroma is some nice fruity esters from the yeast. Taste: This beers is saturated with hop flavor without the bitterness of a pale ale. The hop flavor is mostly citrus and pineapple. There is a light sweetness, but not much malt flavor to speak of. Still, for a 4% beer this one has some nice flavor to it. Mouthfeel: Light bodied without feeling thin. Dry and refreshing but there’s still enough body to maintain a smooth texture. This beer is really juice like in mouthfeel, it really enhances the drinking experience. Overall: Another successful attempt at this beer. I’d be ok bumping this up to 4.5 percent, but I like keeping this light and mild. The hop flavor is exactly where I want it. I’d consider subbing some of the 2 Row for Golden Promise to add a bit more malt flavor to this, maybe even dropping the caramalt and doing all Golden Promise as the base. We’ll see, that’s next summer’s dilemma! For now, I’ve been enjoying this one for a few weeks now and I’m very pleased with the result! This entry was posted in Recipes and tagged 1318 yeast, Blonde, Hoppy, Juicy, Northeast, Pale Ale by White Pointer Brewery. Bookmark the permalink. I’ve only had Eureka one time so its hard for me to give you a good direct comparison, but I can say that this beer has similar qualities if not identical flavor. I feel like this beer hits all the things I liked about Eureka when I had it. Its definitely a chuggable brew with a smooth body, but there’s enough hoppiness that its still an interesting beer. I would say that this beer came out better than the second. This beer will be my summer staple, when I brew it again I’d probably replace the flaked wheat with flaked oats and dial the bitterness back just a touch, moving the 10 minute additions to the whirlpool. Thanks for reading, Giuliano!